Go down the slope to a small circular area, there's a switch on the northern edge that will switch on the lights. After that use the switch on the south side to open up the door to carry on. You'll find the Story Scroll in the bend of the slope down. The Defense Drone is a new enemy, the green circle on the floor spawns out a few small flying machines that fire at you, to stop the spawning simply destroy the control tower nearby. Hit the switch on the right to open up the door. The next section has a load of Arkeyan Blasters surrounding a Defense Drone control tower, destroy them all to open up the monster gate behind. In the next bit there's just one control tower with four spawn points, go for the tower to destroy all four spots. Ignore the door next to the Weapon Master here and instead follow the path up to the left, at the top you'll find another Defense Drone tower and the Treasure Chest next to it. Return to the Weapon Master and go through the door to climb aboard the War Machine. This section is pretty straight forward, shoot down the flying enemies and punch the platforms. The machine will walk by itself and has plenty of health so there's not much you need to do. Up until you get to the fist fight with another War Machine that is, but even there you just need to keep tapping the attack buttons until it explodes. First pull the active switch and then the other switch that will open the door, there's a set of four Arkeyan Defenders blocking your path, you'll have to kill them to progress past their monster gate. 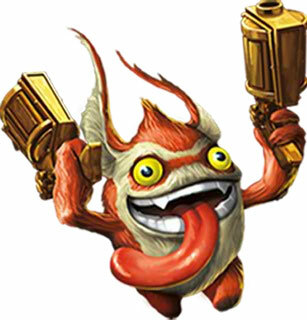 Along the path towards the vault you'll have to kill a whole long line of Arkeyan Blasters lining the route, once you've gotten through them you're there. Go down the steps to where the Eternal Magic Source is being kept, it's locked up of course. Hit the switch and go down the slope to the tiled floor, head left at the bottom and onto the rocky section. In the north-west corner next to a Defense Drone tower is a Treasure Chest. Head south from there and you'll find a blue glowing object surrounded by rocks but no pickaxe in sight. You'll need an Earth Skylander to break through there and collect the Legendary Treasure within. Continue to the right and there you'll see an Air Gate. A lot of moving platforms ahead. If you fall off then walk back to the left and use the teleporter to get back up. Walk along the path and take the first across, the next two move towards each other. Quickly step onto the three platforms moving in and out of the wall, do it as soon as the first one pops out rather than waiting for all three to be in position. Stop there and wait for a single platform coming from the screen rather than walking along the next three, that's the last of the Treasure Chests. Go back and to the right along that second set of three platforms. The next platform won't quite reach so you need to use the bounce pad to get on it at its closest point. The next bounce pad is used as the platform approaches too. You've reached a sort of checkpoint, falling off the platforms now will only mean coming back to here. Use the rising platforms to get up and walk along the undulating platforms, perfectly straightforward. Wait for another platform at the end, you'll be switching between the up and down sides to get to the Present with the Wizard Hat inside. Walk up the steps at the right-hand end and attack the two Defense Drone towers and a line of Arkeyan Blasters, behind them is the Security Card. If you then go north you'll find Voodood's Soul Gem "Impervious Tripwire". Your trip back up to the Security Panel will be interrupted by some more enemies that have spawned in on the slope upwards and the Vault itself, the most dangerous being the two Ultrons at the centre of it all. Once you've destroyed them press the button on the wall to open up the gate and get up to the Security Panel. The first of the three switches is in the room directly north of the Security Panel, approach it and kill the two Defenders that are in there. Next head down to the right for the second door, there's another couple of Defenders in there too. Finally go down through the vault again and north to the third switch. Return to the vault to pick up the Eternal Magic Source. Once you've done that and upgraded your Skylanders, it's time to enter the Lair of Kaos. Trigger Happy can't break the rocks. I don't have an earth yet (or Drill Seargent) and I completed the game twice. I have trigger Happy's Yamato Golden Gun upgrade and his Soul Gem abiltity. It didn't work, he can't break it. I'm still waiting for Prism Break to arrive in the post. Amazon is the worst ever at delivering!!!! Did you go threw the wind gate? I have gotten everything out of this level. I have all check marks except one and I cant figure out how its possible. The only check mark Im missing is "all areas found". I have been through the walk through and there is nothing I have missed. Any help would be appreciated. Thx! how do u punch with the robot? I've tested out all my non-earth Skylanders (most have all upgrades) and only Drill Sergeant can destroy rocks with the "A View to Drill" on the 'Drill Rocket' Upgrade path can destroy them. Will test with other characters when I've maxed them out. I guess it must be like how some non-water characters can go over water then, a few non-earth element characters can smash rocks too. I don't have Drill Sergeant currently so I had no idea he could smash through rocks. Any other non-earth Skylanders capable of it? I managed to destroy those rocks around the Legendary Treasure using Drill Seargant.